Additional Info: Hi! I am Robin Rotela and I have a ton of music experience! 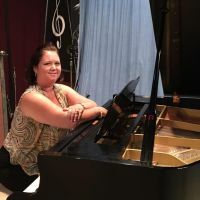 I received my masters in music education from Vandercook College of Music in 2003, where I focused on Vocal/Choral and Piano. I have spent many years accompanying everything from student recitals, school choir concerts, music theatre productions, and professional cabaret singers. I love to perform and do several shows each year with my cabaret group, Main Street Cabaret, as well as with other groups and performers. I often accompany cabaret singers, students for recitals/contests/auditions, etc. I am available for weddings, funerals and special events as well! Fees: Accompanying/Vocal Coaching - $25/30 minutes, $40/45 minutes, $50/hour. Willing to negotiate when necessary.